To book: please contact Mary and Sandra on info@storymassage.co.uk for a booking form. Please indicate which course you are interested in. Cost: includes certificate and training manual. Payment in full or a £30 non-refundable deposit to secure your place on the course. We can invoice schools and organisations. There are still places on these courses unless we indicate they are full. Tuesday 30th April 2019. South London. Jamyang Buddhist Centre, The Old Courthouse, 43, Renfrew Road, London SE11 4NA. More information here: South London Course. Monday 20th May 2019. Fife. The Ecology Centre, Kinghorn Loch, Kinghorn, Fife KY3 9YG. £149. More information here: Fife Course. Tuesday 21st May 2019. Fife. The Ecology Centre, Kinghorn Loch, Kinghorn, Fife KY3 9YG. £149. More information here: Fife Course. Tuesday 4th June 2019. Chichester. Eleuthera Studio, Summer Lane, Birdham, Chichester. £149. More information here: Chichester Course. Wednesday 12th June 2019. Portlaoise, Eire. Golden Egg Holistic, Glenfield, Portlaosie, Co Laois, Eire. €170. More information here: Portlaoise Course. Thursday 13th June 2019. Belfast. Tor Bank School, 5 Dunlady Road, Dundonald, Belfast BT16 1TT. £149. More information here: Belfast Course. Tuesday 5th November 2019. North London. The Arc Centre, 98b St Paul Street, London N1 7DF. £149. More information here: North London Course. Friday 6th December 2019. Brighton. Purple Turtle Training Academy, Grand Studio, Old Slipper Baths, Barrack Yard, North Road, Brighton BN1 1YA. Read more here: Brighton Course. To book: for more information and a booking form please contact Mary or Sandra via email on info@storymassage.co.uk or telephone 01243 779600. More information: Do check out our answers to Frequently Asked Questions about our Story Massage training days. Story Massage FAQ. Please note: Your place on a course will be confirmed when the full amount is paid. Fees are refundable up to 7 days prior to the course date. However, an admin fee of £10 will be charged. You may send a substitute delegate. Ten simple massage strokes form the basis of all our stories. We will teach you these strokes and then work with you to adapt familiar stories and even create some massage stories of your own. 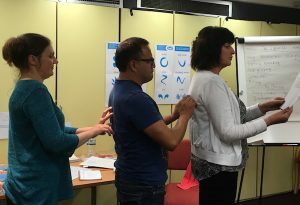 This will help build your confidence with using Story Massage in the way that most suits you. During the training there will be plenty of opportunity to ask questions and share ideas with others. It is fun and interactive, just like Story Massage. The day’s training is supported by updates and ideas via a Newsletter, Facebook Community, Blog and YouTube channel. 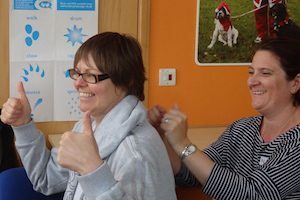 Anyone who has an interest in using the Story Massage Programme to encourage positive touch for children – whether you are working for an organisation or you’d like to use it in the home – will benefit from this training. We can tailor your training to suit your particular needs. Here is a video to show Story Massage in a variety of different settings. “Enthusiastic and passionate trainers who brings her varying experiences to the course. 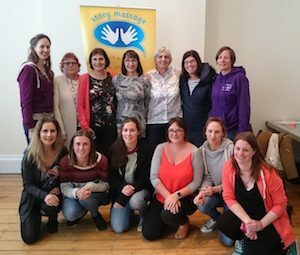 Wonderful, hands-on, interactive training that has added a new dimension to my infant massage courses”. Natalie Leunder, Infant Massage and Yoga Instructor. Andrea Bilbow OBE Chief Executive ADDISS (The National Attention Deficit Disorder Information and Support Service). “What an amazing training day! 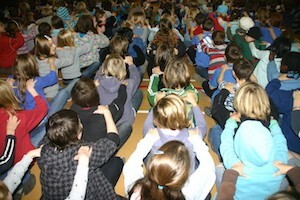 It is very rare to find an activity, which can engage all learners no matter what their needs, age or disabilities. Mary and Sandra are very experienced and knowledgeable and have produced a clear and easy to follow programme. It offers flexibility to develop your own stories and make it unique to your setting. The feedback from all the school staff who attended the course was excellent. 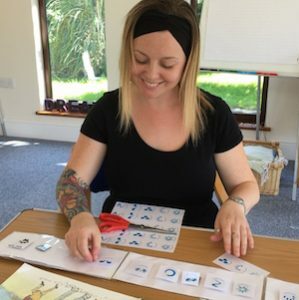 We are now delivering story massage sessions across the school on a daily or weekly basis.” Lisa Lawrence, Sensory Co-ordinator, Ysgol Y Deri Special School, Penarth. “The course was everything I wanted and more! Your delivery was superb, encouraging us all in every way. 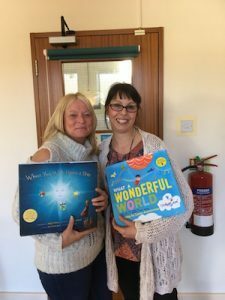 You have developed a lovely healing experience for children of all ages and levels of understanding.” Caroline Prudames, Holistic Therapist. Do check out our answers to Frequently Asked Questions about our Story Massage training days. Story Massage FAQ. 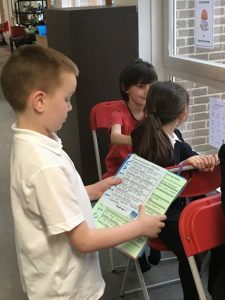 Charlene Craig, Nurture Teacher, Quarry Brae Primary School, Glasgow." Cheryl Kennedy, Autism and Wellbeing Consultant for AIW Consultancy.